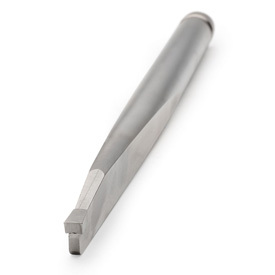 The Robert Sorby® RS2000 Hollowing System Slicer Tool features tungsten carbide tip with hollow ground nose that allows you to make deep plunge cuts, at any angle, to remove cones from bowls or vessels. The Slicer should be mounted in the Armbrace Handle with the Adjustable Side Handle in a convenient position (vertical position recommended), to counteract downward forces created during cutting. To sharpen, we recommend using a "credit card" diamond sharpener.